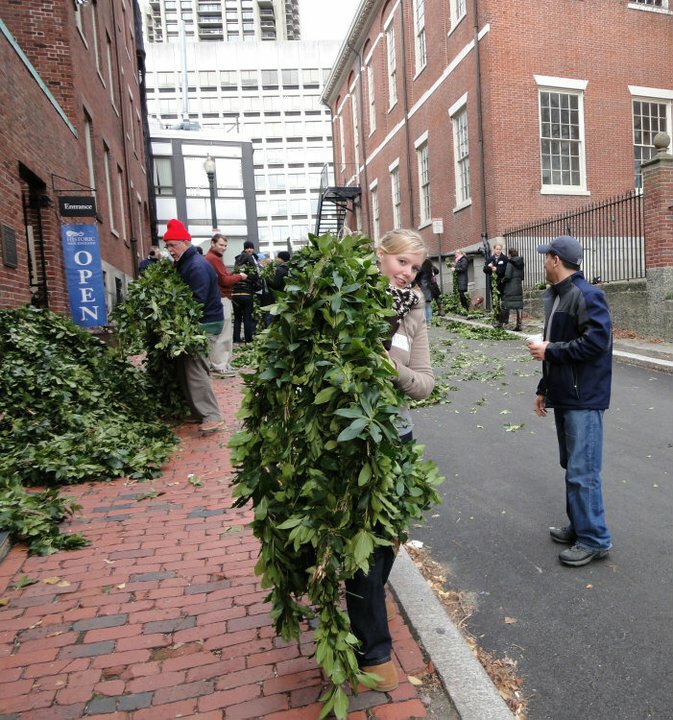 On December 4 and 5, hundreds of volunteers arrived at the Otis House to measure, cut, and prepare 2,860 yards of fresh laurel garlands. The garlands were then wrapped around 1,200 historic gas lampposts on Beacon Hill, topped by festive red bows. The annual holiday decorating of Beacon Hill is coordinated by the Beacon Hill Civic Association and funded by private donations and a fundraiser. This year, volunteers included Beacon Hill residents, Boston Cares volunteers, Suffolk University students and staff, and local supporters. The decorations remain in place until mid-January, so stop by the Otis House for a tour, take a brisk walk around Beacon Hill, and consider ice skating on Boston Common’s Frog Pond or warming up at one of the many restaurants on Charles Street. Beacon Hill is decorated and ready for winter visitors.